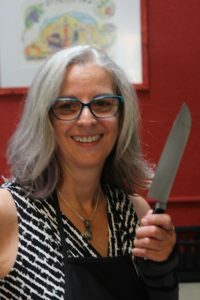 All Cooking Demonstrations are facilitated by Linda Voorhis, Culinary Instructor and Master Vegan Lifestyle Coach and Educator. All classes are hosted by Ahimsa Wellness, LLC, in a private kitchen at 5230 East Whisper Ridge (in Verde Santa Fe), Cornville, AZ 86325. To ensure that there is an ample amount of food for tasting, no walk-ins can be accepted. Due to a family emergency I have had to suspend all upcoming classes until further notice. If you’d like to see the delicious results, head over to this page. This class was held in Veganification’s BRAND NEW outdoor kitchen. Outdoor cookery is no longer just about grilling. Did you know that you can bake, roast, and sauté on your outdoor equipment? We used not only the standard grill but also some unique outdoor cooking equipment to create delectable dishes without heating up our indoor kitchens. Check out the pics here! See what you missed out on! Check out the pics from this great class! With the height of the Women’s Liberation, mothers heading out of the house to create their own career paths, and the ‘Me’ generation, shortcuts in the kitchen became ‘the thing’. We’ll be revisiting and veganifying some of those noteworthy dishes. Do you remember the pantry item whose tag line was, “One pan, one pound, one happy family”? Oh, and that infamous baked good scene from “My Big Fat Greek Wedding”? Just a hint of what you’ll be enjoying in this class. Check out the full write-up and the great pictures from that class on the Retro Review! Food nostalgia at its best. This menu brought me immediately back to my childhood memories of a cold winter’s night gathered around the family dinner table enjoying this meal that was not only delicious but reminds me of a typical June Cleaver-prepared meal. Want a full review of what we ate? You can look at our pics from that night too! Check it out here! We’ll be delighting in a variety of wraps, sweet and savory, that will remind us of worldly adventures with a few diversions here and there. Interested in checking out how this class wrapped up (get it – wrap? – LOL!)? Check out the photos here! Whether you are looking to strike up some romance this month or entertain family or friends, this class takes a trip back in time. We’ll be updating classic dishes with a modern and more healthy approach…without sacrificing any flavor, I promise! A delightful, sweet, creamy treat without any of the guilt! Appetizers and desserts that are sure to impress your guests. These dished can all be made ahead and parked, ready to serve whenever you are so you can be the host(ess) with the most(est). Tired of serving the same-old, same-old every Thanksgiving? This class will shake up the Thanksgiving table paradigm with dishes that will be beautifully served and delectably devoured at your Thanksgiving table, using expected ingredients and some surprises.. Invited to celebrate at someone else’s home and need to bring a dish? No worries, this class will have you covered (as in ‘covered dish’). Perfect Timing to Stop and Enjoy a true British Tea Often mistakenly referred to as “High” tea in other parts of the world, the British Afternoon tea is typified by tea with sandwiches, scones, and cake served on tiered platters. As we delight delicacies, both petite savories and sweet confections, we’ll learn the differences between the British Afternoon Tea and High Tea. If you are interested in learning about other prior classes, please contact Linda Voorhis. You can also follow Veganification on Facebook!